Three customers at the bar, I approach, I know one of them. They order drinks, I get them for them, set them down. They give me money, I ring it into the register, go to give them change, and then one of them says, I hear you’re in Blade. I have heard that phrase 4,147 times in the last ten years. That’s a good estimate. I bet I hear it at least one time a shift. I’m not complaining, mind you. Just telling you how it is. I’m proud of my accomplishment of getting in a big Hollywood movie. Who wouldn’t be? How I got the part is a somewhat interesting story. My agent calls, says I have an audition for a movie called Boogie Nights. I pick up the script, take it home, read it, and am amazed. Wow, what an incredible script! And I’m reading for the lead!!! I’ve got four days before my audition, I’m going to work on this. I reread the script probably four times. I memorize my lines for the three scenes I’m doing. I think about the part, how I’m going to do it. I really throw myself into it, like I’ve never prepared for an audition before. I mean, it was such a phenomenal script, and I’m telling you, the actor that gets the part, if he does it right, has a chance for an Academy Award nomination. That’s how good the part was written. I’m ready for that to happen. The day comes for the audition, I go in, meet the casting director. She’s definitely big time, been in the business for years. Unfortunately, there’s no camera for some reason, but I don’t think about it. We do the scenes, I kill it. After we’re done, the casting director says a lot of kind words. I know I did a good job. Unfortunately, she tells me, THE PART HAS ALREADY BEEN CAST with Mark Wahlberg. Bummer! Why the hell am I here, then? I thank her for the audition, leave, and think about what could’ve been, while walking to my Toyota Corolla. About a week later, I get a call from my agent. She says, the casting director for Boogie Nights really liked you in the audition, and she’s recommended you for a part in a movie that’s being cast called Blade. I thought, great! A chance at a part. I pick up the sides (the scene I’m doing), take it home, read through it. It’s a nothing part, one scene. Oh wow. From lead in a killer movie, to day player. That’s how it goes. I go in for the part, do a fine job, big deal, it’s something like five lines. Gotta charred cadaver for ya. Oh yeah. Academy Award winning material. On set, I remember doing the part. Of course, I put my heart and soul in it. No small parts, just small actors. I made sure my hair was extra greasy. Imagined this guy works the late shift, 12 hours a night. He’s been doing it for years, nothing fazes him. A charred cadaver? Big deal. Seen it all before. That’s why I played the part nonchalant. Not I GOTTA CHARRED CADAVER FOR YA! Like it’s the weirdest thing I’ve ever seen. 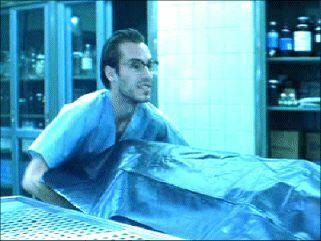 Just relaxed, another day at the morgue. I also envisioned him drinking mounds of coffee, in a cheap, styrofoam cup. Not the healthiest guy in the world. A perfect guy to work the late shift at a morgue. I remember getting done with the part, I was on set for 45 minutes max. I was outside, and was talking to the director, Steve Norrington. Way cool guy. I said to him, how ‘bout you bring me back at the end of the movie, as a vampire? Funny enough, I never even read the whole script. Ok I guess I heard it at the table reading, but I didn’t remember if it was possible. I was just throwing it out there, see if I could get another couple days on set. It was funny, I could tell he was humoring me, saying that he’d think about it. Really cool guy. Another thing I was proud of was my name in the movie. In the script, it was “Morgue Attendant #2.” Generic, nothing part, just something the bigger actor will play off of. But I guess, something happened, I don’t know what, but they changed my name, to Creepy Morgue Guy. How cool is that!!! I thought that was funny. Getting back to the beginning of the story, imagine if you will, really put yourself in my shoes. Let’s say 20 years ago, you do something for one day, it’s seemingly insignificant, but in the end, it DEFINES YOUR LIFE. Every day, 20 years later, someone mentions that 45 minute span of time in your life. I’m not complaining. Just making an observation. Gotta charred cadaver for ya. This entry was posted in Random Story on November 25, 2014 by Clint Curtis. Good post. You’ve been places and done things lots of people only talk about. Wonder what stories your boys will be able to tell some day.